Fashion, Fashion, Fashion... I know that it has been a lot of what I have been talking about on my blog these days. Please don't think that is all that you will find here. Allow me to explain a bit. After being heavy and uncomfortable with gaining so much weight from pregnancy - I lost all of my mojo. I didn't care to get dressed up, made up, or about going out. Essentially, I've been in hiding for the past two years. More than two if you count the tail end of pregnancy when I weighed in at 180 lbs. I'm only 5'2" so that was really hard for me. 50+ pounds later I am finally looking and feeling like my old self again. I'm making up for lost time. More family fun posts and less fashion for a while! Time to share our most recent family photo! 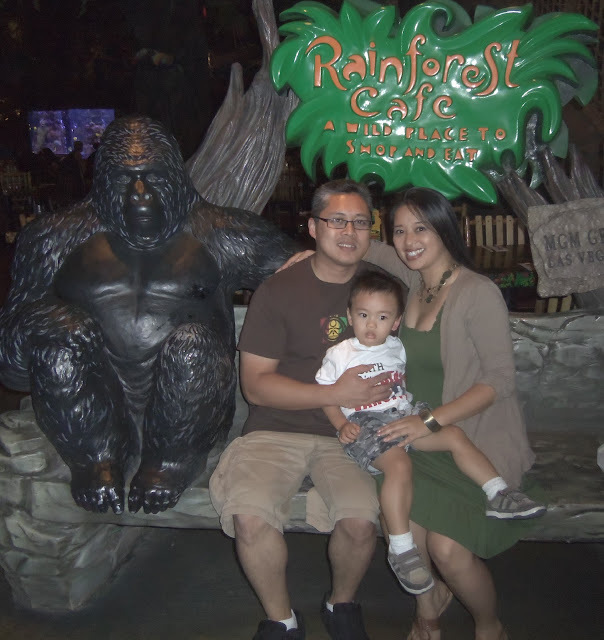 Here we are after having lunch at The Rainforest Cafe in Las Vegas! One of these days we'll have a photo of all three of us smiling! Back story on the missing smile: The restaurant had a HUGE aquarium right in front of us and our little man was mesmerized by the HUGE fish swimming around. My hope is that you will stay tuned for my future posts! I'll be back on random mode before you know it. I'm working on it! I've been having so much fun blogging more regularly. AND in case you hadn't noticed, I finally got my custom domain: http://www.lifebycynthia.com is MINE. I made the jump after much hesitation. It feels good! Hopefully my list will keep me on task! Enough about ME. What are YOU blogging about these days? Hey Cynthia. These sound wonderful although I am all about your fashion posts as well! My blog continues to document our family life along with a healthy dose of fashion and beauty. Susan Don't get me wrong there will be more fashion, just not as much. I'm running out of outfits! I love that you can fit it all in! Savy Green Saver Great advice! "Post what you love" - will do! Thank you ladies for sharing your comments! It means a lot to me. Wow, that's amazing that you can actually plan what you are going to blog about that far in advance! Kudos to you and wonderful that you're having fun! Haven't been to Las Vegas yet--wanna go sometime! Have a great weekend! I enjoy your fashion posts, and reading about the places you go. Not all of us are so lucky, so it's fun to live vicariously through what you're posting, and the events you've been going to look fun! Great commitment to post. I wish I could think ahead but I can't/don't. Love the photo. You lost 50lbs? Wow! That's quite an accomplishment! Good for you. Sounds like you have a lot of great ideas. I look forward to reading them in the future! I loved your fashion posts but I totally get that post-baby weight how it gets you down so when you lose the weight you want to shout to the world! The family fun ideas are awesome though! Congrats on losing 50 lbs, Cynthia! I'm looking forward to your 30 Day Fitness Challenge post. A custom domain will help you with sponsors, etc. It was a good move! I'm so happy for you on your weight loss! Keep it up, and share:) I think you do have to feel good to wear certain clothes. I love fashion posts by the way! Fashion posts are fun, so write what you love. You look amazing and 50 pounds is an incredible accomplishment! Love that you own your domain now :) And I'm glad that you're where you want to be in terms of your weight. Congratulations on that! Yes, I did just realize you finally have your domain name! YAY!! !